Each May, the U.S. Department of Health and Human Services’ Administration for Community Living leads our nation’s observance of Older Americans Month. It is a time to recognize the contributions of older Americans and think about how we can work together to support and value people over age 65. The 2018 Older Americans Month theme is “Engage at Every Age”. It’s meant to remind us that you are never too old (or young) to take part in activities that can enrich your physical, mental, and emotional well-being. It also celebrates the ways in which older adults positively impact our communities. In commemoration of Older Americans Month, we’ve put together a list of activities you and your local community can do this month, as well as throughout the year, to thank older adults and help engage our aging loved ones. 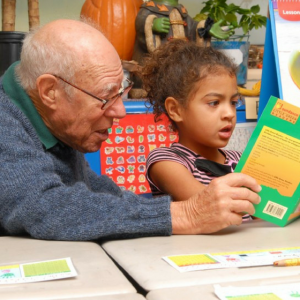 Start a mentoring program where seniors help children succeed in school. Encourage local community or fitness centers to offer nutrition classes to educate on healthy eating for seniors. Work with your local town hall to host a meeting to discuss and find out what community services seniors want, as well as ways to involve the community in helping make new programs a reality. Encourage your senior residents to share their life stories with others by participating in story circles. Host weekly story circles focused on a specific topic and allow everyone to discuss. The stories they share would be interesting for people of all ages. This can be done at area seniors centers or local churches. Help an older person gather family photos and make an album or scrapbook about their life and the legacy they will leave. Get their children and grandchildren involved as well. Encourage your local community center or library to host a game day that will stimulate our brains and keep them sharp. Bring together senior groups to prepare meals and provide for those less fortunate in the area, or consider volunteering at a local food bank. Teachers and other school administration can help local students set up interviews with residents of a retirement community, assisted living community or nursing home, and write short biographies for a school assignment. Then plan a program in which the students read aloud their stories. Invite families of students and seniors from the communities to attend. For ideas on how to celebrate growing older, read last year’s post on Aging Out Loud. At FirstLight® Home Care, we believe in supporting our elderly community members by providing home care and senior care services that promote mental and physical wellness for our elderly loved ones and their families.